Just around the corner from the club house, and in back of the 1st hole sits this adorable attached duplex home. Convenient with a million dollar view! Entrance hall, large kitchen with kitchenette, lots of cabinets and counter space, overlooking the living room, beautiful wood floors, crown molding and on to the large lanai, with the adorable water fountain. So relax and enjoy the view. Large master bedroom with walk in closet. And two guest bedrooms round this off to make the perfect home. Never mow a lawn again, HOA pays for replacing the roof and painting the outside. Large double wide drive way. All this and you are in the Groves Golf and Country Club, a large club house with restaurant, ball room, library/media center, fitness-card-art rooms, pro shop, challenging golf course, heated swimming pool, Jacuzzi, bocce, tennis, pickle ball, dog park, community garden, fishing hole and miles of conservation. Drive your golf cart, or walk, to Publix, restaurants, salons, bank, vet and more. 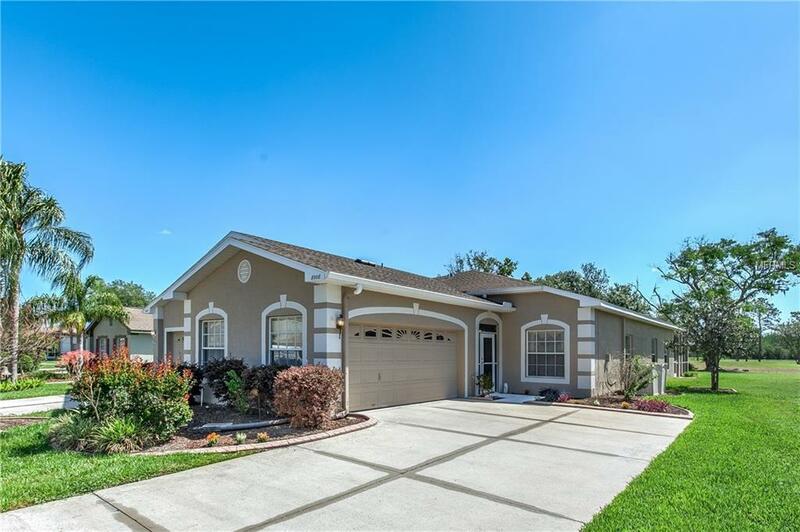 Just north of Tampa, international airport, shopping, beaches, and amusement parks. The Groves isn't just a place to live it is a way of life. Come visit you will want to stay!